This Sinkology 3.5 in kitchen disposal flange is designed and manufactured for easy installation and durability. The solid brass construction and removable stopper makes this ISE compatible drain the perfect fit for any copper kitchen sink. The new and improved design improves performance while looking beautiful with Sinkology antique copper sinks. Dimensions 7.0 In. X 6.0 In. X 4.0 In. We purchased this to go with our new *** *** handmade copper sink. It matches beautifully. I will note that there are no threads on the bottom of the flange to attach to your garbage disposal. It requires a clip. We had to purchase a new disposal because this flange did not fit our old disposal, which required a threaded flange. This was an extra *** that we did not anticipate. However, now that everything is installed we absolutely love it. I was highly impressed in the quality of the material! The color pairs nicely with our cafe brown granite sink and antique copper faucet and soap dispenser. The color is a very nice brushed copper look, unique and beautiful! This stopper works perfectly with our Sinkology copper sink. It is a must have if you buy the sink. The disposal drains flange looks great, but doesn't work with my garbage disposal, so I have to get an adapter before I can install it. Other than that, it's perfect. I purchased this to go with my Sinkology Ganku sink, also purchased on O.co, and it is perfect! I couldn't be happier!! If I hadn't bought this item, I would have been stuck with the silver metal garbage disposal flange in a copper sink. SO happy I got this! New sink new disposal drain and stopper. Just the right product and color. Renovating kitchen bought the faucet and flange haven't purchased the sink yet due to budget constraints. Am impressed with both products received from overstock. My kitchen is going to look amazing when completed. Currently in demolition mode. Bought this for use in my copper sink, looks great and is made to fit my disposal. The finish seems well done. I haven't installed it yet so cannot comment on its durability. I expect it to perform well coming from Sinkology. Works great and matches the sink. I was surprised that this stopper came two days earlier than the scheduled delivery. On top of that, I was pleasantly surprised that it was as heavy as it was and matches the sink perfectly. This arrived today and it’s so heavy and well made. I can’t wait to use! My kitchen remodel is just getting started. This will be icing to my copper sink. 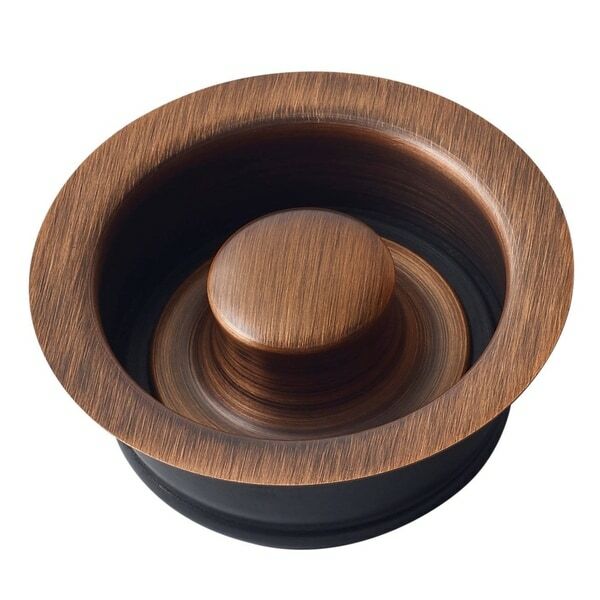 love this stopper, goes great with our copper sink and the matching copper faucet we bought. i will be buying a second one for our island sink. Great quality. Very happy with purchase. Much less expensive than other places. You don’t be disappointed with this purchase. "How do you install this product? My sink has the old silver flange on it and it is already installed." Kitchen sinks have basket strainers which consist of the flange body, a stopper, rubber gasket, fiber gasket, and a metal ring that is threaded and used to secure the flanged body to the drain opening of the sink. I like to use plumbers putty applied to the flange bottom to seal the body to the sink. If there is a thin rubber gasket in addition to a thicker gasket, the thin one can be used between the flange and the drain opening that is recessed. The flange needs to be water tight, so the body need to be installed in this order. Apply putty under the flange or the thin gasket a place in the recess. Holding the body securely, place the fiber gasket on the metal ring with the thick rubber gasket on the fiber gasket and carefully thread the ring on the body and thighten securely. To remove the existing flange, the metal ring that secures the flange body to the drain opening needs to be unscrewed by using a large pair of adjustable plier like channel lock pliers or a tool made to remove and tighten the ring located under the sink. A hammer and a metal punch could also be used to loosen the ring. There may not be much room under the sink to work in, so be careful. Just remember righty tightly, lefty loosey. Hope this helps.